Note: As I’d like to start sharing more recipes on my blog here at http://www.ceoofthehome.net, I invite readers to share their ideas too if you have made similar recipe and want to add or offer more ideas through comments–happy meal-making! The summer heat for Floridians makes fresh, cool produce an appealing choice for snacks and meals–especially for our children who can get easily overheated after playing outside during days that easily see air temperatures in the 80s-90s and humidity levels consistently over 70%. Here’s a fun pairing of fresh options for a light lunch, in-between snack or anything else. Dice tomatoes, onions and pepper in a bowl, drizzle juice on top and mix cilantro in. Serve with your favorite tortilla chips, I personally love either Garden of Eating organic blue corn chips, Late July or Florida Gourmet Chips found at many of our south Florida produce stands. Note to Parents: it is advisable to serve your young children the salsa by placing it on top of each chip arranged on a plate. Tostitos brand has the Scoop chips that are perfect for little ones as well. This is a refreshing drink that can be manifested in so many different ways–mix the above ingredients together as you see fit in whatever fun cups you have and straws are always a hit for little ones. 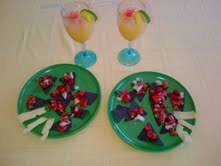 Garnish with wedges and top the drink with colored sugar. I’ve even used a little splash of Pom juice to help the color for visual enjoyment.